OW! is the official ultimate club of Oxford University and all students and staff are welcome to join. Our teams compete regularly throughout the year against other university teams, and sometimes also against club teams. Ultimate is an official sport of the British College and Universities Sports (BUCS), with Indoor and Outdoor Nationals worth BUCS points to the eight highest ranking institutions. The competition structure varies across the divisions (a result of BUCS recognition) so the men will play BUCS weekly fixtures (outdoors) from the beginning of the year whilst the women’s calendar is more clearly divided into two seasons – indoors (Michaelmas term and beginning of Hilary) and outdoors (Hilary onwards) – and operates on purely a tournament format. In 2015 men’s outdoor regionals was replaced with BUCS “Wednesday Leagues”. These are individual matches held across the year and the results determine qualification for Nationals. More information can be found here. Since Oxford does not give its students Wednesday afternoons off for sports, our weekly matches are oftentimes re-scheduled for weekends. When we host such a game, Sports Fed provides us with pitches and if we travel, they pay for the minibus rental so players only need to contribute fuel costs (less than £5 usually). Tournaments are weekend-long events: the team will typically drive to the venue on the Saturday morning (or depart on Friday evening if the venue is more than a couple of hours away) and return on Sunday evening. You can expect to play three or four games on the Saturday and two or three on the Sunday. For the work-oriented, there is usually time between games and on Saturday evening to study. We receive a small amount of money annually from the university’s Sports Federation but this doesn’t cover the cost of entering all the tournaments we enter in a year, let alone flood-lit pitch hire for the darker months, so we ask our players to pay a subscription fee (“subs”), which is £15 per term or £35 for the year. This money goes towards tournament entry (approx. £180 per team per tournament) and training costs. New members will also automatically receive a complimentary OW! disc upon paying subs for the first time. Transport to and from tournaments – we hire minibuses/cars for each event and this is the main expense. This usually costs between £15 – 25. However, from 2018 onwards transport hire will be paid by Sports Fed for BUCS tournaments (i.e. Men’s & Women’s Indoors/Outdoors) and so this cost will be reduced for those events. Accommodation on Saturday night (and Friday if far away) – sometimes free (e.g. sharing another player’s house) but otherwise can be around £5 for a scout hut/community hall. Food – a team dinner is organised by the social secs for the Saturday but you will need to bring food for the day time! A supermarket run is often done on Saturday as well so don’t worry if you don’t pack enough for two days. UKU membership – required for insurance purposes! “Basic” annual membership can be purchased for £5 but full membership (£18 for students) is necessary for Nationals (and if you want to play club ultimate as well). Basic membership can be upgraded at anytime for £13. Kit – players have the option of purchasing kit in Michaelmas. A full set of playing kit is two tops (one white, one dark blue) and a pair of shorts: this costs around £50. The club also has a few sets of spare kit that can be borrowed if you don’t want to buy it. In addition, Kitlocker supply Nike apparel bearing the Oxford Ultimate logo which can be purchased any time during the year but these are purely optional and are not required for tournaments. We aim to inform players of an estimated tournament cost when the rosters are released so that there aren’t any unpleasant surprises when you return to Oxford after an exciting weekend. The club is very aware that its members come from varying financial backgrounds and it is one of our main goals to ensure that money doesn’t prevent players from attending events. Many colleges provide bursaries for students involved in university-level sport too! If you are at all worried about financing your time with us please contact our treasurer, Andrew Bunting. We’re a happy club and like to spend time together on the pitch and off. From post-training breakfasts to formal hall exchanges, crew dates to movie nights, our social secs will be organising events that cater to all tastes and everyone is welcome. Stay tuned via Facebook (links are in the footer) and our mailing lists. Feel free to suggest an event as well! 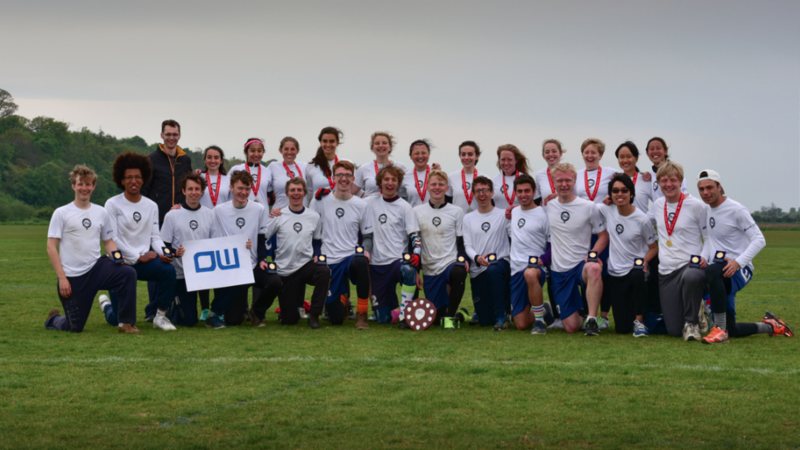 Ultimate is a half-blue sport at Oxford. Blues are prestigious awards presented to athletes who compete at the highest level of university sport, including the Varsity match against Cambridge. The criteria for awarding these, and lists of past recipients, can be found on the Blues website. Vincent’s Club and Atalantas are clubs for sportsmen and women, respectively, at Oxford. They run social events and can also provide financial support: membership is not restricted to holders of blues. The official documents governing the club can be found here.